Success in volleyball like modern air warfare relies heavily on human reaction time. Boyd training led him to a greater understanding of human reaction time and as a result his pilots had a 10 to 1 kill ratio over the superior Mig-15’s by the end of the war following his strategies. I believe volleyball players / coaches who follow similar strategies for volleyball can also enjoy far greater success on the volleyball court, particularly in sand. 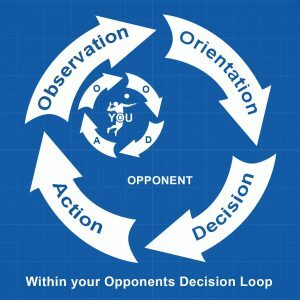 Getting inside your opponents loop (OODA Looping Your Opponent) means that you complete your loop processing quicker than they do. Ideally you should complete your full cycle while they are still in the orientate stage so that they get stuck in the observe – orientate phases: Always assessing, never deciding, and never acting. Their loop is OO – OO (Observe Orientate – Observe Orientate), while you may have completed full OODA Loop (Observe Orientate Decide Act) once or more. Another important way to think about operating inside the OODA loop of your opponent is when you change the situation (Shape the mind of the opponent) more rapidly than the opponent can comprehend. And keep doing it. In beach volleyball where strategy is far more important than indoor volleyball this may be as simple as running a 3 block call where the player shows angle and at the last minute dives into the line while his partner starts line and runs the angle shot. In this simple example the blocker “shaped the mind of the opponent to see that the angle shot was open and the hard line ball was open. Then at the last minute the defense switched so that the blocker blocks line and the defender runs from the line to the angle. Also be sure to look at my article this week 4/9/15 on beach volleyball strategy using “Hicks Law” to OODA Loop your opponent. This is a powerful, easy to use strategy that works on most player even those at the top level. Please note, this is article 4 – Andor Gyulai OODA Loop / Volleyball Coaching Blueprint Series.